‘Magicat’ is a game inspired by the 2D platformer’s glory days. But how can a game predominantly made by one man possibly measure up to the genre defining greats of the early 1990’s? Desire for 2D Platformer Games has really fluctuated over the last three decades. There was a time when every other game involved moving from left toright, jumping over obstacles and onto the heads of enemies. However by the mid nineties the once popular genre looks quite old fashioned and in a World with a taste for polygons no one wanted flat jumping sprites. Games like ‘Super Mario 64’ and ‘Crash Bandicoot’ showed that, in the hands of the right developer, the strengths of a traditional platformer could be carried over into a three dimensional environment and gamers didn’t seem to want to look back. Magazines would even mock games that favoured 2D Sprites over 3D Polygons. N64 Magazine infamously ridiculed the masterpiece that is ‘Castlevania: Symphony of the Night’; a game that’s now celebrated for its intricate sprite work. “Compare these shots of the PlayStation version of ‘Castlevania’” they wrote while previewing ‘Castlevania 64’. “Whereas the N64 version features fully 3D characters and backgrounds, along with dazzling lighting effects, the PlayStation title is a flat 2D platform game. No comparison really”. A decade later however, Nintendo threw the genre back into the public eye with ‘New Super Mario Bros’. Although it used polygon characters, the gameplay echoed the 2D 8bit and 16bit platformers that had been their bread-and-butter twenty years earlier. The game went on to sell over 30 million copies worldwide, becoming the best-selling game for the DS and one of the most successful games of all time. Other Developers saw the genre as once again profitable and, as always, success led to imitation. Although not as popular as it once was, 2D platform games trickled out since. 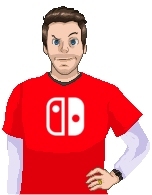 Nintendo have continued to support the genre of course but it is often the goto style of game for smaller indie companies. Perhaps this is because they’re the games that developers played in their own youth and there’s a nostalgic desire to recreate past loves. Billy Lukmaryo certainly loved the genre growing up. He is the man behind Kucing Rembes, an indie developer based in Surabaya, Indonesia. Before going solo, the Lukmaryo made ‘Miracle Fly’ with ElagoTech. With a unique control method and over a hundred levels, this quirky platformer found favour with Steam reviewers, and Lukmaryo hasn’t ignored his roots for the games spiritual successor. ‘Magicat’ is certainly his baby. 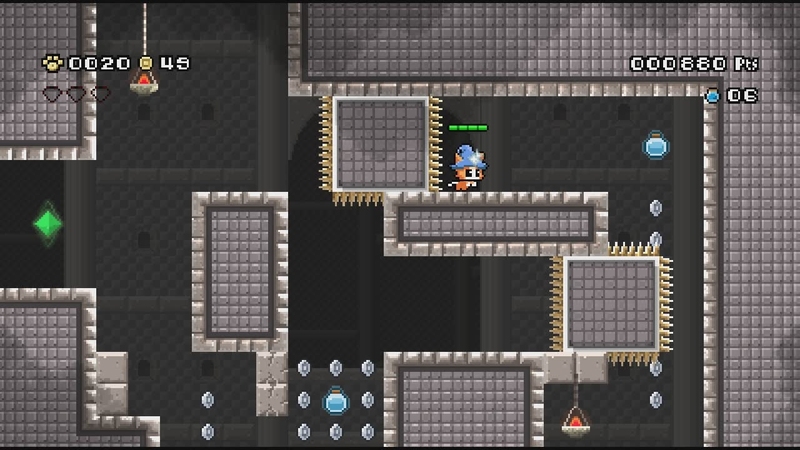 Lukmaryo worked on the Code, art, music, game and level design. Like its predecessor, ‘Magicat’ enjoyed overwhelmingly positive feedback on Steam where it’s been available for a year. 93% of players recommended it, with one enthusiastic player calling it “perfect” (provided you like Cats and ‘Mario’ Games). According to Steam, “there is no story in ‘Miracle Fly’. The characters are just having fun in the Dream World”. At least Lukmaryo has put a little bit more effort into a story this time, but do not expect too much. You play as a Magical Cat, keen to recover a gem stolen by a top hat wearing flying monkey. While there are dialogue boxes they consist of nonsense text. I have no idea what “maw meow maw!” means and it’s not even a translation issue. Playing the game in Japanese is equally nonsensical. As it’s essentially a story exclusive through pictures its fortunate that the opening cut scene does look nice and ‘Magicat’ is certainly an attractive game. Like the 2D Platformer genre, taste for Pixel Art has fluctuated over the years. While it was considered outdated a decade ago, today, characters made of tiny square blocks seem very fashionable. Dan Malone,one of the greatest pixel artists of all time, famously said he would spend the nineties trying to “hide the pixels” but artists today celebrate them. ‘Magicat’ is even sold with a promise of a “Handcrafted retro experience [with] colourful pixelated art”. Kucing Rembes have done a great job recreating the era and ‘Magicat’ could easily be mistaken for a SNES or Amiga game, with its vast on-screen colour palette. The central Magical Cat character is charming and most of the ‘Kirby’-like enemies are so cute you’ll feel bad about killing them. Levels are visually varied and the clean uncluttered look means it’s always obvious what is a platform and what’s decoration. There are niggles though. There’s little variation in enemies besides palette swaps and more fundamentally it should be far more obvious when your protagonist is crouching. It’s something you do a lot. You use it to vary the trajectory of your popcorn-like projectile, you depend on it to avoid enemy fire and it’s required when you need a moving platform to pass over head. However, despite your dependency, a crouching Magical Cat is only two pixels shorter than a standing one. Colour changes for your playable character are available as you progress through the game, but most are so garish you’ll favour the default option. 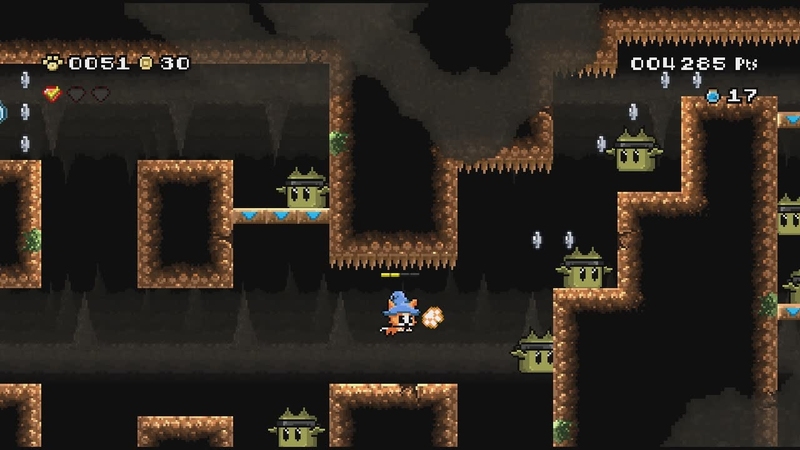 ‘Magicat’ boasts 63 individual levels spread over 7 worlds. Whilst that sounds like a lot, it’s worth remembering that ‘Super Mario World’ has 74 different stages and 96 ways to finish them. The levels in the Nintendo game are also far more complex and sophisticated than what’s on offer in ‘Magicat’. 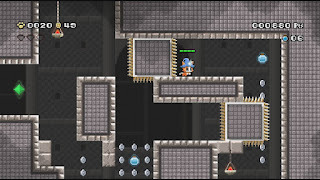 Once mastered, a skilled player can finish most of these stages in a couple of minutes and they are more reminiscent of ‘Little Samson’ with vertical sections mixed with horizontal running. There’s nothing really Revolutionary on offer, although there is at least a lot of variety. Stages tend to include moving platforms and switches that activate or manipulate them. All the staples of the 2D platforming genre are accounted for including swimming sections, slippery slidey ice, gravity inversion, ladders and pulleys. Controls are tight and responsive and holding jump allows a slight ‘Yoshi’s Island’esque float. 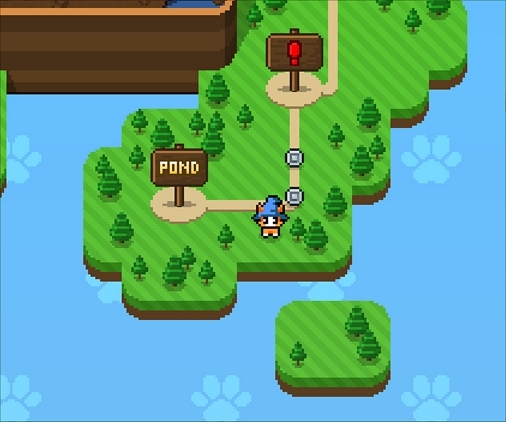 While the game may look like an attractive 16bit game, ‘Magicat’ plays more like an 8bit one. It’s reminiscent of the type of platforming you’d have enjoyed on the NES, partly down to the small player sprite and large open play areas. Whilst this console was popular, the phrase “Nintendo Hard” was often uttered by reviewers; used to discuss games that were infuriatingly difficult due to unfair and unforgiving level design. The Houston Press described the “Nintendo Hard” era as a period where games "universally felt like they hated us for playing them." If this is true, the same phrase should be attributed to ‘Magicat’. There’s a reason why it’s in a section of the Steam catalogue dedicated to hard games; after the first ten levels the game becomes brutal. Apparently ‘Magicat’ was designed to “satisfy those that love to face challenges”. Often the odds are stacked against you and you’ll need lightening fast reactions to make it through a stage. It would be palatable if it was like ‘Super Meat Boy’ where you feel responsible for your own demise and the challenge seems surmountable on a subsequent attempt. However, all too often, failure in ‘Magicat’ seems unavoidable. 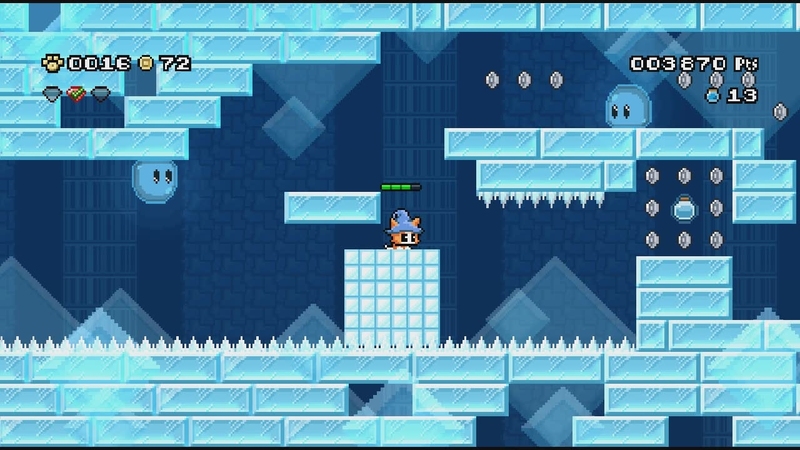 Enemies loiter too close to the edge of the only platform that can be jumped to, or gaps can only be leapt over if you launch at a precise moment. Your Magical Cat can withstand four hits, but frequently a single mistake will force you into a situation where multiple hits are unavoidable. You do get better through repetition of a stage, but the majority seem to be impossible without prior level layout memorisation. Things would be easier if (rather than having nonsense story text) the game actually made some effort to explain what the plethora of collectibles in ‘Magicat’ was actually for. Prudent use of the things you pick up softens the hard edge of the stages. But, with no in-game instructions, the only way you’ll learn this is through trial-and-error. For example, Coins in stages are plentiful but collecting 100 doesn’t earn you an extra life. Thankfully those are infinite in ‘Magicat’. Instead one hundred coins earn you a paw token which can be traded for extra energy during a stage. Initially this will cost two paw tokens but each time you use it, the fee doubles. So, should you want to refill your energy twice in a stage you’ll have to spend a total of six paw tokens. If you die the paw tokens are refunded, however if you complete a stage they are considered spent. Continue points in ‘Magicat’ are similarly bought but with a different currency. MP can be found in blue bottles scattered throughout the stages. This can either be spent activating the continue points, or can be Squandered on a dash attack that’ll kill a level foe in one hit and will do significant damage to a boss. Further into the game you can also use a third type of currency to purchase upgrades. These character improvements allow you to spend your procured MP in other ways during the levels. Notably the refresh skill allows you to trade 2MP for another energy bar, which proves particularly useful, even if it does make the Paw Tokens somewhat irrelevant. 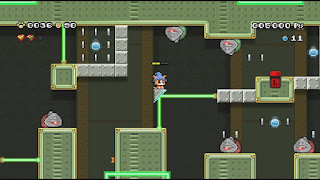 Levels are selected from a map reminiscent of ‘Super Mario World’ and bizarrely almost identical to the James Pond game ‘Operation Starfish’. You can do the stages in any order and their completion removes an obstruction from the map; allowing access to other stages. Alternatively a hammer can be purchased which performs the same function. In fact purchasing enough hammers actually allows you to skip huge sections of the game, which is how a 24 minute speed run is possible. But the world map isn’t the only thing that’ll be familiar to long term 2D Platformer aficionados. There’s so many throw backs to classic platformers, some discreet some shamelessly obvious. Take each stage’s boss fight for example. Every boss chamber is foreshadowed by a corridor with a door to pass through reflective of a ‘Mega Man’ game. Like ‘Donkey Kong Country’ most of the bosses are an enlarged version of a standard level enemy, which must be shot with popcorn or jumped on. Like ‘Duck Tales’ they all have set attack patterns that must be memorised and to defeat them you must seize the most opportune moment to attack. Once their onscreen energy is depleted, the Bosses vanish in a shower of items reminiscent of ‘Rainbow Islands’. That being said while the formula may be familiar there is still a lot of creative ideas at work during the boss battles. Very few are simply bullet (or should that be popcorn) sponges. There’s typically an additional gimmick to contend with. These include vanishing platforms that appear and disappear depending on where another enemy is on screen. 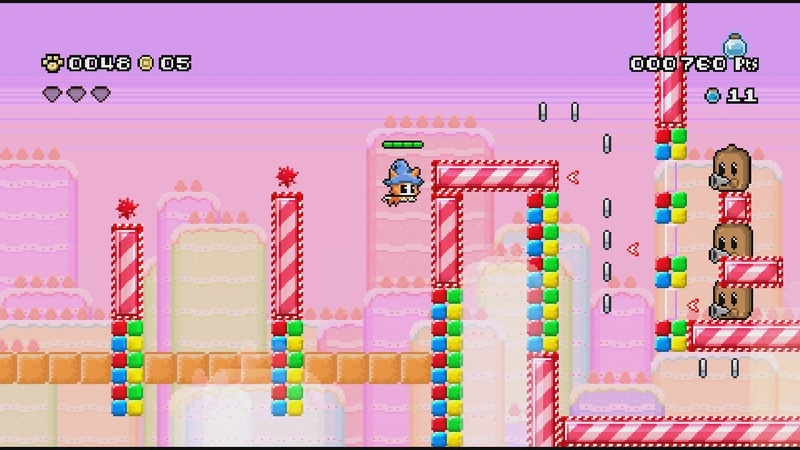 Conveyor belts that’s restrict or accelerate your movement, battles while riding balloons and even stages where you must use the attacks of one enemy to defeat or subdue another. 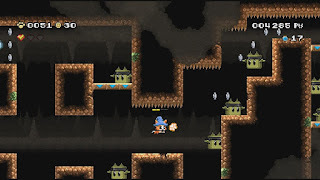 The game’s description on the eShop boasts that each stage has “their own unique boss battle” and like the levels that preceded them, most are exceptionally challenging. Without a full energy bar, it’s likely you won’t be able to defeat a boss on the first attempt, so it’s always wise to reserve some MP to activate a continue point just before an encounter. Avoiding Frustration at the difficulty isn’t the only reason why ‘Magicat’ is best played in short doses. The music, while whimsical and cute, is also simultaneously repetitive and grating. 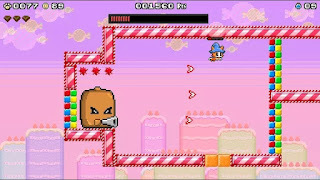 There are a number of tracks throughout the game but none of them last longer than a minute, so be prepared to hear the same melodies repeatedly frequently while playing. Thankfully you can turn the music volume down in the main menu but all this does is emphasise the ear abusing sound effects. Every jump, every burst of popcorn has an accompanied sound. This makes ‘Magicat’ a very noisy experience considering these two actions are what you do most in the game. Presuming you like a challenging game, there’s really nothing particularly wrong with ‘Magicat’. If the goal of Billy Lukmaryo was to create a 2D platformer with varied brutally hard levels and adorable graphics he’s succeeded. But despite what some on Steam might proclaim, this certainly isn’t one of the greatest platform games ever made. 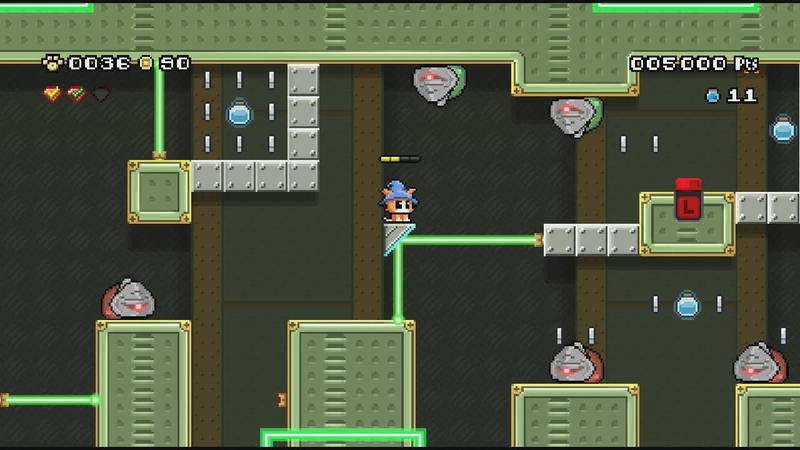 ‘Magicat’ isn’t as good as ‘SuperMario 3’, it’s not going to give ‘Mega Man 2’ a run for its money, and it’s doesn’t even measure up to ‘Chip n Dale Rescue Rangers ’. It emulates the greats of the platforming genre but never surpasses them, which gives you a weird lingering feeling that you’d have had more fun playing the better games that inspired this one. With NES games now so easily playable with Switch Online, they are more accessible than ever and now they won’t cost most Switch players any money at all. That being said, for £5 ‘Magicat’ is hardly expensive. While it never measures up to its inspiration it is still fun, it’s pleasant and it’s functional. Like a super market own brand product, it reminds you of something better but still satisfies. Especially when it inevitably becomes a Mainstay In the eShop sales. Set expectations appropriately and you’ll no doubt be happy, at least until the difficulty becomes unbearable. 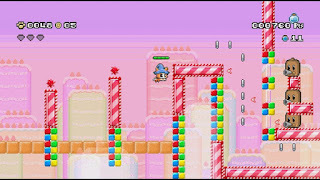 In its heyday the Platformer Genre would expand by at least a couple of commercial games each month. You couldn’t flick through a SNES of Mega Drive Magazine without seeing a review for a new release. So many platformers hit the shelves and the vast majority were pretty dire by-the-numbers fare. Were ‘Magicat’ released during the era that developer Kucing Rembes seems to be in love with, it would have stood head and shoulders above most of the competition. Super Play, Sega Power and Mean Machines would have called it good but not great and bestowed a 70% score. Today such assessment remains valid. While ‘Magicat’ doesn’t exceed its inspiration, when that inspiration includes some of greatest games ever made, this shouldn’t come as a surprise.